Oracle OpenWorld kicked off in San Francisco yesterday, the 22nd of October and will run until Thursday, the 25th of October. Version 1 representatives were invited to attend the 19th of October for the exclusive Oracle pre-advisory briefings and will be keen to hear from other attendees in our network. Keep up to date with us throughout Oracle OpenWorld @Version1Tweets. Big news and roadmap clarification for all customers of Oracle E-Business Suite. There will be no release 12.3 as we may have expected – but instead we will have 12.2 around until 2030, with roughly annual releases which will allow take up of technology upgrades without major release upgrades. 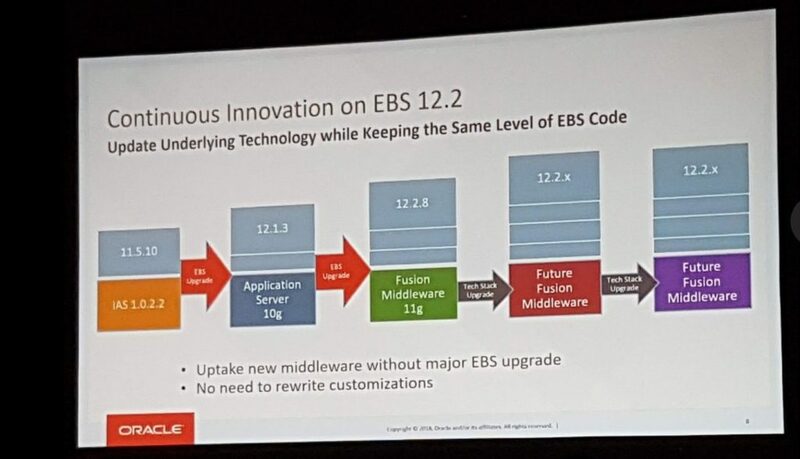 The image below from Cliff Godwin’s Oracle E-Business Suite Strategy Update explains this nicely from 11i to where we will be until 2030. What Does Continuous Innovation Delivery Mean for Oracle E-Business Suite Customers? Oracle are committing to Continuous Innovation on Oracle E-Business Suite 12.2 onward with premium support until at least 2030. This means that ongoing innovation and underlying technology stack updates will be delivered continuously without major upgrades. But after today’s announcement, it now is as follows for 12.2, and it may go beyond 2030 in one-year increments at Oracle’s discretion. Now, this is big news! 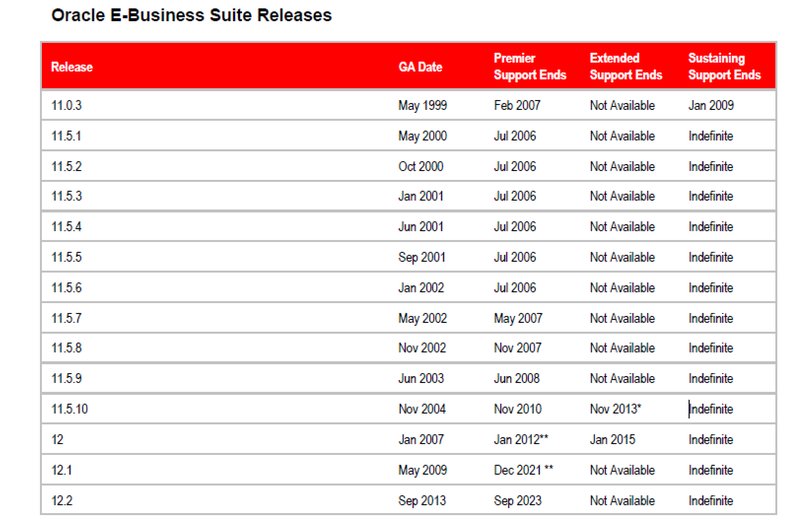 In short, for Oracle E-Business Suite customers, our advice is to upgrade to 12.2 as soon as possible – if not already – and you are in Premier Support until at least 2030! 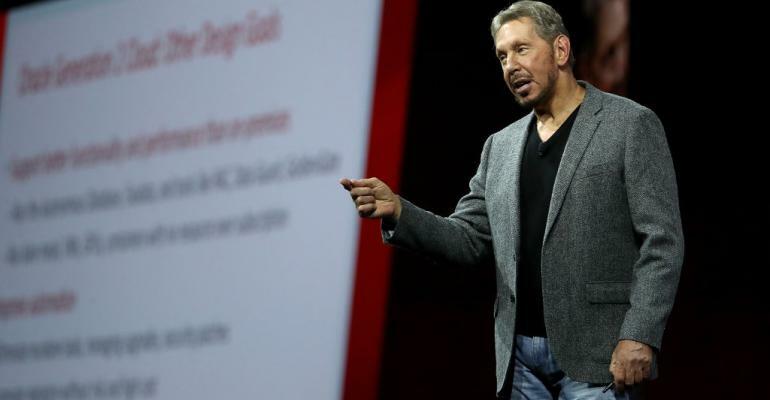 As is expected now from the major Cloud provider events, in the first keynote of Oracle OpenWorld yesterday, ‘Think Autonomous’ Larry Ellison placed a focus on providing like-for-like comparisons between Oracle Cloud and one of its competitors – AWS. Overall the keynote featured some considerably lofty claims that are spectacular enough to at least be called out for us all to make our judgements on the impact when we move Oracle workloads to Cloud all flavours. There were several key points of attack on the architecture provided in Oracle Cloud Infrastructure (Gen 2, or not ‘Classis’) some clarification on terminology did help, for those not au fait with it, versus AWS. The key point of this was the security and ring-fencing of the architecture which is built in to Oracle’s Cloud versus AWS. 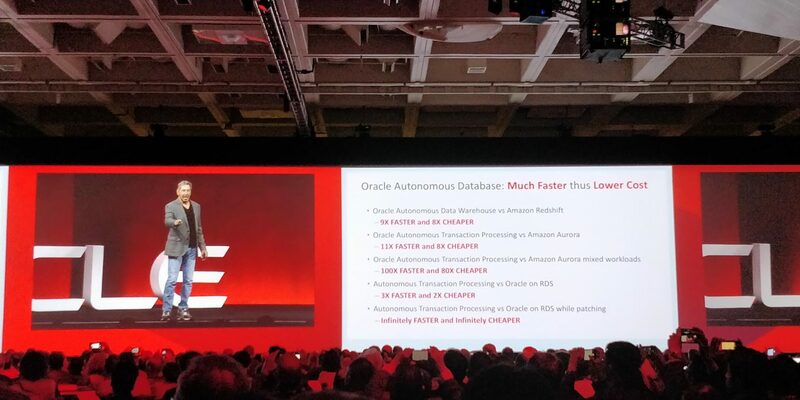 But what was of more interest, as so often is the case with these, was the benchmarks provided for Oracle Database versus AWS (Aurora / Redshift). Now that is a big claim and sounded extremely ambitious – but then when you understand the intricacies of licencing for Oracle on non-Oracle clouds, it becomes a less surprising claim. In reality it could be put down to nuances of the licencing of Oracle on other Clouds, than any technical superiority and that’s a pity because the tech side really is very impressive based on the benchmarks completed by Oracle. So, these are impressive claims, but let’s try and summarise what the key conclusions to take away from this presentation. Oracle Cloud Infrastructure (OCI) in base function is impressive, has real innovation and can match up more than adequately to the competition. Additional regions announced by Oracle will help drive its adoption. Oracle Cloud Infrastructure, rather than the previous generation ‘Classic’, is the only game in town now. Oracle need to work on how they will migrate early adopter customers from former to the latter. Oracle running on Oracle Cloud is always going to be compelling for lots of reasons and the numbers here bear the performance element of this out. 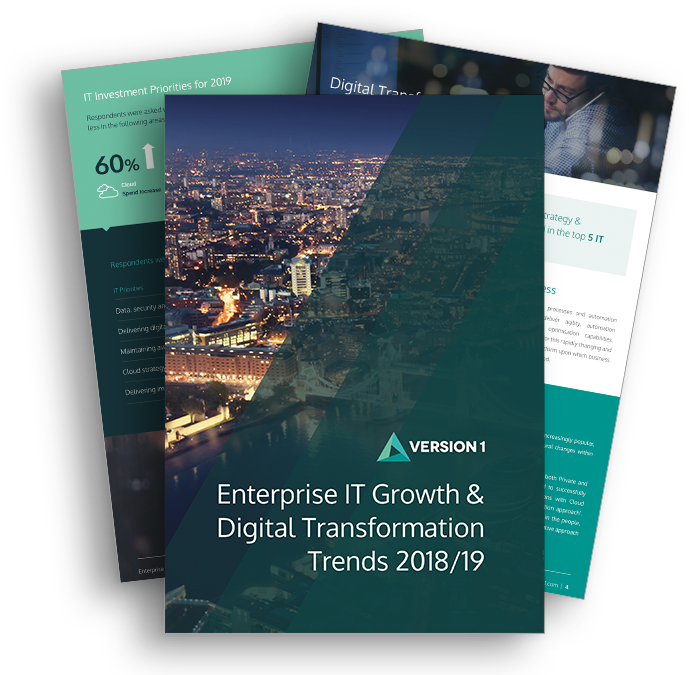 The Autonomous element of the solutions from Oracle shows a direction of how things will evolve in this space over the coming years – a big consideration and benefit for customers. But remember, some of the benchmarks are for ‘edge’ solutions/cases from Oracle. AWS have and will continue to invest heavily so this could become a Cloud ‘arms race’ which could be a great benefit ultimately to our customers. Finally, what we see from a technology provider at their own conference is always subject to ‘Safe Harbour’, so what we see on the ground at Oracle OpenWorld may not reflect the actuality when one comes to implement what we see here – so some of this could be construed as forward looking. Stay tuned for more updates from Version 1 from Oracle OpenWorld and don’t miss our last blog post: ‘Ones to Watch: Version 1 at Oracle OpenWorld 2018’.